As I add more years to my resume I’ve noticed my interest in history is growing deeper. There is something amazing about reflecting on our past and being able to digest it with our current perspectives. Admittedly most of my attention is focused on the technological events, those epiphany moments that literally revolutionized our world or altered our existence. The old saying ‘what a time to be alive’ has never been so true. If you don’t believe me, just try to explain to the next kid you see that when you grew up you didn’t have Google! They will look at you like a caveman. The things that really amaze me in my personal journey through history are all of the discoveries that were made or inventions created that were ‘before their time’. Those events that seem to have been forgotten because of various reason but later, only through review, do we see just how innovative or forward thinking they were. What if those had been recognized at the moment of conception, we’d all have flying cars and hover boards…which by the way I’m still waiting on. Leonardo da Vinci sketched a version of the early helicopter in the 15th century A.D. The first ‘actual’ helicopter was built and flown by Igor Sikorsky in 1939 A.D. (over 400 years later than da Vinci’s conception.) In da Vinci’s notes he does caution about the hazards of flying and suggests the test pilot should first try the mechanism over a body of water. Smart guy. There is archaeological evidence of actual, working flushing toilets in Sicily (Minoa) that date back to 1800 B.C. Call it what you will, lavatory, loo, water closet or simply toilet… if the world would have embraced flushing toilets. Thousands of years later, like the 1200 A.D. time period, people in the city of London would literally just throw ‘it’ out the window and into the streets…I’m not kidding here, they would of course, respectfully shout “gardez l’eau” (watch out for water) before hurling their…’business’ out onto the street. We had not yet made the correlation between sewage and disease. I am fortunate as I do not currently need glasses or vision correction however many people I know do. In 1636 A.D., Rene Descartes ‘neutralized’ the cornea by placing a water filled tube over the eye. Of course this isn’t very practical but it would still take centuries before it would be perfected into a functional contact lens . Giving credit where credit is due, Leonardo da Vinci deserves a shout out as he envisioned (see what I did there) the concept of correcting eyesight by placing lenses directly over the eyes. It would be 150 years between da Vinci and Descartes and hundreds more before they became practical…why so long? This invention consists of a simple blade-less steam turbine which spins when the main water revision is heated. Pretty simple right? The principles of this invention are the exact same as the modern jet engine. Oh yeah, it was invented by Heron of Alexandria in the 1st century A.D. He saw his invention as a novelty or a toy…what if he or others had really seen its potential? We all take full advantage of our GPS navigation systems now. I mostly use the one built into my phone, however, did you realize that the first in-car map reader was conceptualized and built in the 1930’s? The albeit crude car tech was actually a working map/guidance device which you mounted into your car to assist drivers. The device came with a set of paper maps that scrolled as you drove (it even adjusted scrolling speeds depending your driving speed.) I feel like we may have gotten things right with this one as it only took us a few decades to work out the kinks and embrace it into our every day lives. None the less, I bet you didn’t know there were options other than Google maps until now! It shouldn’t be much of a surprise that I find myself in this area of exploration as I myself have founded a company that is challenging the way we think about data and how we access it, how we utilize it, how we manage it instead of it managing us! As I personally go through the process of introducing new technology to the world I see how hard it can be for us to embrace it. I see the self erected hurdles to changing how we do things, how we fall into the trap of just doing the same things as we always have, and how we set ourselves up to miss out on our ‘ah moment’. With near two decades of litigation technology experience, Brian’s passion is to build and provide better solutions. “There are major challenges with eDiscovery solutions today, and my goal is to provide technologies that take them head on” says Indexed I/O’s CEO Brian McHughs. “There’s no better feeling that creating something that helps others. The bigger the problem, the more satisfying it is to solve it.” Brian makes sure to take time for personal passions which include enjoying the great Colorado outdoors, golf, time with his family, and when time permits, relaxing on a downtown Denver roof top with a nice local microbrew. Indexed I/O Corp is a developer of high-speed, cost-effective data processing and analytic solutions. Its product is targeted to Corporate Counsel, Law Firms, and IT Departments requiring eDiscovery services for litigation. 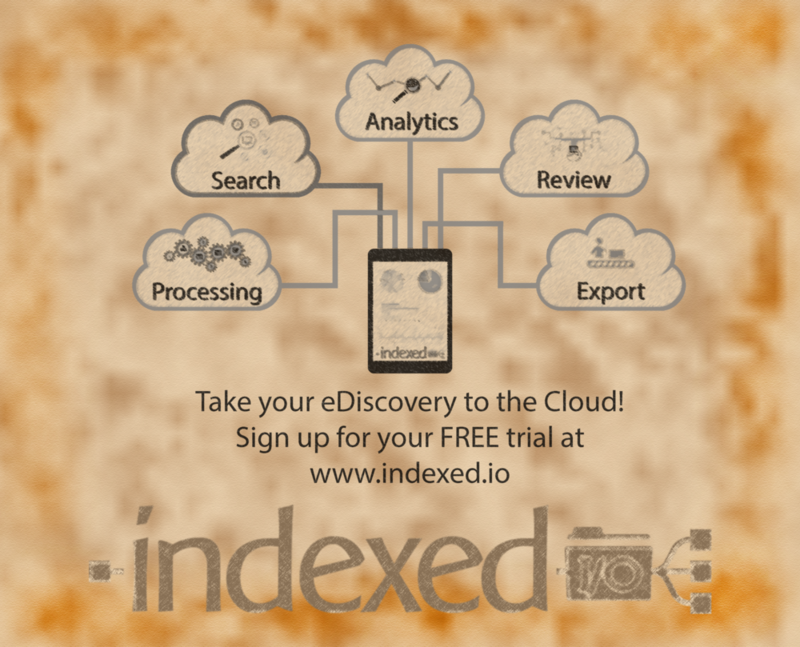 Indexed I/O‘s eDiscovery solution includes data processing, data culling, document review and tagging, and exports/productions. Indexed I/O offers state of the art ‘more like this’ search capability as well as traditional search and language analytics. With an easy and intuitive interface, legal teams can quickly learn and utilizeIndexed I/O in a matter of minutes.